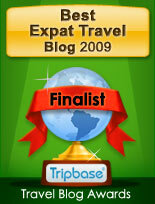 South African Expats: Greta Steyn of Fin.24.com hates my grammar. So what? 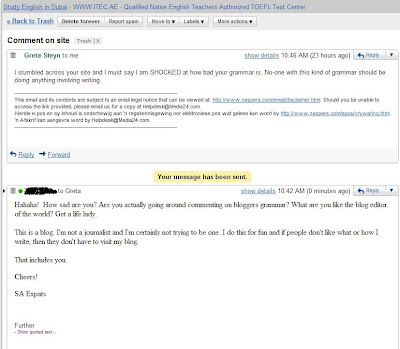 Greta Steyn of Fin.24.com hates my grammar. So what? Greta Steyn to me: She took the time to send me an e-mail. "I stumbled across your site and I must say I am SHOCKED at how bad your grammar is. No-one with this kind of grammar should be doing anything involving writing." Hahaha! How sad are you? Are you actually going around commenting on bloggers grammar? What are you like the blog editor of the world? Get a life lady. This is a blog. I'm not a journalist and I'm certainly not trying to be one. I do this for fun and if people don't like what or how I write, then they don't have to visit my blog. What a cheek she has...who does she think she is...You keep writing as we love your blog!!!!! Lol! Thanks Marci. In her next email she called me stupid and a racist. I haven't written anything racist and she sure as hell doesn't know me, so I don't know where her "stupid and racist" comments come from. I hope as a journalist she does more research into her articles before writing something down, than she does in her e-mails. If the only people who blogged had 20 years of journalism behind them (I checked her credentials on the site),then I, and the wonderful bloggers I follow wouldn't be out there. And that would just be a shame!! Last I knew, you didn't need a degree (or even good grammar) in order to blog. Or have the rules changed, and I didn't get the memo? Oh my, why would anyone say something like that to a blogger? Weird. Keep right on blogging, eh. Desia - It boggles my mind. Altogether now...Greta Steyn get a life MORON - there are far more PRESSING problems in SA! I'm sorry. I consider myself to be part of the Grammar Police (whilst reserving the right to have rampant typos and grammatical errors on my own blogs) but I just don't see what she is on about. Your blog is really well written. How dare she anyway? And was she talking on behalf of Fin24.com? I think these journalists are feeling threatened by the fact that anyone can write a column these days. In fact, some bloggers probably get read more than some of these pathetic journalists with their "political studies" qualifications. We all know the journalist students at university were normally the useless scumbags who smoked dope and never had to go to class. Come on Greta, visit my site and give me a review. I'd like to hear from you. You're welcome to call me a racist, a communist or a pacifist - I really don't care. HOW can you live with yourself??? i think you should cancel your blog, stay in the house, and we will sew an apostrophe or comma onto your t-shirt so that everyone will know you are one of "those" people who doesn't punctuate (oh wait, that's me) or use grammar correctly.